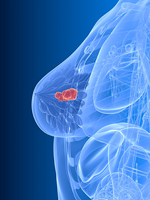 Interim data from a recent clinical trial of nelipepimut-S (NeuVax; Sellas Life Sciences Group, Inc) plus trastuzumab (Herceptin; Genentech) showed a disease-free survival advantage compared with trastuzumab alone in patients with HER2 1+/2+ breast cancer. Nelipepimut is a cancer vaccine comprising part of the HER2 receptor protein, combined with granulocyte-macrophage colony-stimulating factor (GM-CSF). The vaccine stimulates production of T-lymphocytes against cells expressing the receptor, which then prevent recurrence of the cancer. In some patients with breast cancer, expression of HER2 in their tumors is so low (immunohistochemistry 1+/2+) that trastuzumab alone is not sufficient for an antitumor response through HER2 signaling inhibition or antibody-dependent cell-mediated cytotoxicity. In this population of patients, nelipepimut-S appears to synergize with trastuzumab. In the prospective, randomized, investigator-sponsored, phase 2b trial, all node-negative patients had triple-negative breast cancer (TNBC), as did the majority of patients with low-volume nodal disease; the remainder of the patients had disease that expressed hormone receptors. At a median follow-up of 19 months, an independent Data Safety Monitoring Board conducted a safety and efficacy analysis among the overall population of 275 patients, as well as the 2 primary study target populations (node-positive and TNBC). There was a clinically meaningful difference in median disease-free survival—the primary end point of the study—in favor of the active arm (nelipepimut-S plus trastuzumab) versus the control arm. The analysis revealed hazard ratios (HRs) of 0.67 and 0.61 in the intent-to-treat (ITT) and modified ITT populations, as well as a 34.9% and 39.5% reduction in the relative risk for recurrence in the active arm versus the control arm in the ITT and modified ITT populations, respectively. In the cohort of patients with TNBC (n = 98), a clinically meaningful and statistically significant difference was reported between the 2 arms, with an HR of 0.26 (P = .023) in favor of the combination regimen, and a 70.4% reduction in relative risk for recurrence in the active arm versus the control arm. In addition, there was a clinically meaningful and statistically significant difference between the 2 arms in favor of the combination regimen in the cohort of patients not receiving hormonal therapy (n = 110), with an HR of 0.24 (P = .009) and a 74.1% reduction in relative risk for recurrence in the active arm versus the control arm. The analysis also showed an adverse event profile with no notable differences between treatment arms. The addition of nelipepimut-S to trastuzumab did not result in any additional cardiotoxicity compared with trastuzumab alone. “We are very pleased with these findings, which suggest that NeuVax + Herceptin may provide a clinically meaningful benefit to breast cancer patients with low to intermediate HER2-expression, especially given the recent report of the NSABP B-47 trial showing no benefit in these patients with Herceptin alone,” COL (ret) George E. Peoples, MD, FACS, principal investigator of the trial, commented in a press release from Sellas Life Sciences Group, Inc. “Furthermore, our trial has shown a significantly improved disease-free survival in women with TNBC. The favorable findings for this cohort are particularly promising, given the limited treatment options for these patients with high risk of recurrence and death. We look forward to presenting these data at an upcoming major medical conference and to supporting Sellas in the regulatory and developmental pathway for NeuVax,” he said.